Representatives from the Ohio EPA and the Historic Preservation Office of the Ohio History Connection met with Middleport Officials on Friday to discuss the brick streets impacted by Phase I of the wastewater project in the village. 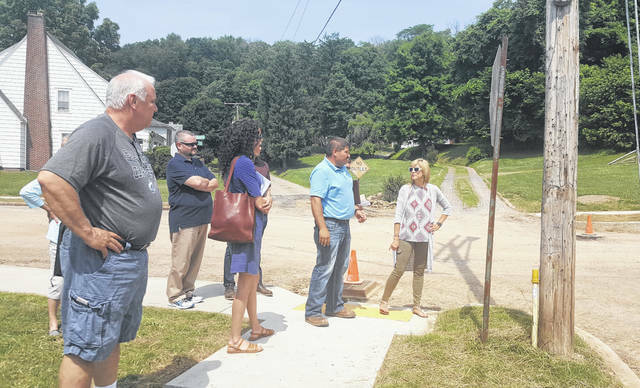 MIDDLEPORT — Representatives from the Ohio EPA and the Ohio History Connection’s Historic Preservation Office met with Middleport Village Officials on Friday to discuss the wastewater project on Main Street and impact to the brick streets. While the original plan for the project called for the exposed brick to be put back in place on Main Street, unforeseen soil issues resulted in a change order to allow for paving on a portion of Main Street and the placement of brick on a portion of the street. The concern with the possible historical nature of the bricks led to concerns from residents and calls to the Ohio History Connection and others which prompted the visit on Friday. Walking Main Street, Village Administrator Joe Woodall explained that the soil conditions on the portion of Main Street from Fifth Street to Seventh Street required an eight foot trench to be dug instead of the planned four foot trench due to poor soil conditions. With the additional trenching came the change order to pave rather than replace the brick. To relay the original brick on the street would be an additional $276,000, something that would be a direct cost to the village. While Phase I of the project is completely funded by a principal forgiveness loan through the Ohio EPA, the additional cost would not be able to be part of that as the amount of funding cannot be modified. The funding option for the additional $276,000 would be for the village to take out a one percent interest loan for the cost. In the areas where the village is not planning to relay the bricks, crosswalks using the brick have been built. The councilman credited Woodall for his work on the project and helping to come up with a solution. “You can’t see what is underneath,” said Conde of the project taking place and the new infrastructure being put in place. He added that while things are torn up at the current time, it is progress taking place for the village. Woodall and Conde admitted that communication of the change and the reasons for it were not communicated as well as they should have been to village residents, leading to many of the concerns and issues which have been brought to light in recent weeks. Woodall emphasized that all of the Main Street bricks were kept by the village to be used on Main Street and for other possible projects within the village. Those bricks are stored and are not available to the public. Possible ideas for use of the bricks from Main Street include a walk way in the green space to be created in the Second Avenue area (where buildings have been and are to be demolished), as well as a walking area at the Marina. Other ideas will also be discussed depending on the amount of bricks remaining. The bricks which were buried near the Marina two weeks ago were not the bricks which were exposed on the streets, but rather bricks which were under asphalt in areas such as Seventh Street and Lincoln Street, stated Woodall. As for Phase 2 of the project, Woodall said there will be an addendum to the contract which requires the relaying of any exposed brick streets impacted by the project. All brick streets impact in that phase of the project would be put back as they were before the project. Diana Welling of the Historical Preservation Office stated that she will likely recommend to the Corp of Engineers, which is partially funding Phase 2, that a public meeting be held regarding the impact of the project on the brick streets. The next step for Phase 1 is for the EPA to submit information regarding the change to the Historical Preservation Office, which is expected to be done on Monday. At that point the Historical Preservation Office will make its recommendation on the project and whether or not they will ask for the bricks to be placed back in their entirety. Possible ruling from the Historical Preservation Office include that the bricks are historical and must be put back, that the bricks are not considered a national historical property and the village can proceed as planned, or some solution in between the two (cross walks could be part of this). A decision from the Historical Preservation Office is expected next week. https://www.mydailytribune.com/wp-content/uploads/sites/42/2018/06/web1_6.10-Middleport_ne201868142019498.jpgRepresentatives from the Ohio EPA and the Historic Preservation Office of the Ohio History Connection met with Middleport Officials on Friday to discuss the brick streets impacted by Phase I of the wastewater project in the village.